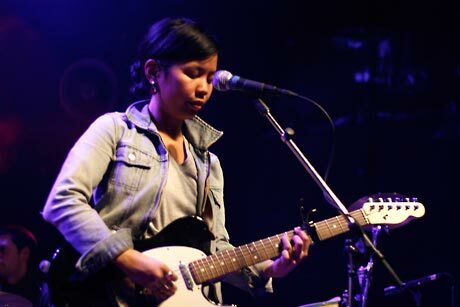 Already the toast of Torontos indie circle, the sisters Mecija approached their opening slot with a subdued confidence and politeness. Filling the stage with an efficient supporting cast of friends, Casey and Jenn wooed an early crowd looking to hear what all of the glowing reports have been about. The organic harmony of their gently strummed, orchestral bedroom pop came to fruition and confirmed what everyone was expecting. Although at times the tender mood proved a little too dainty for some onlookers (conversations abound), it was more a case of yet another elegant band getting lost in the citys willingness to chitchat instead of discover some raw talent.